The EC Bullets is proud to have developed a tradition of excellence that has helped over 500 players receive college scholarships to play fastpitch softball! Over 500 players have received scholarships to play College FastPitch! In addition to Coach Schnute's 18Gold Team's 1st Place National Rank, other EC Bullets teams were also represented in the National Club Rankings. EC Bullets 16U Caldwell finished the season with a National Ranking of 27th and EC Bullets 16U Pisciotta secured a National Ranking of 89th. 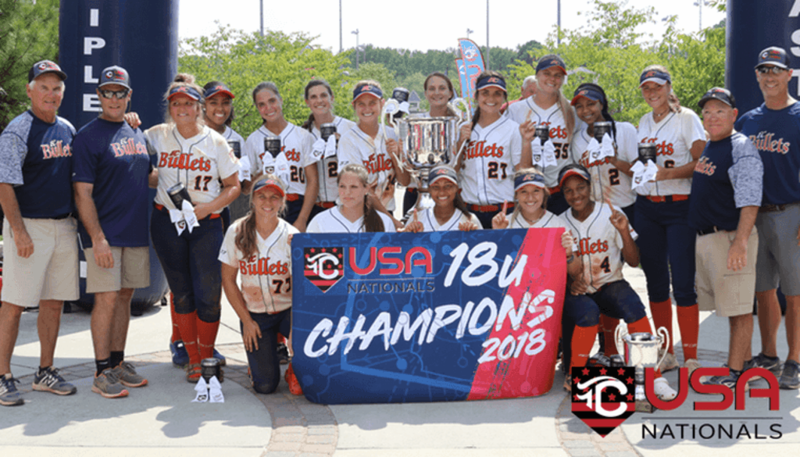 In the 14U Division, EC Bullets 14U Biele boasts a National Ranking of 12th overall and EC Bullets 14U Mayfield finished the season with a National Ranking of 43rd. Proving the quality and depth of the EC Bullets teams was EC Bullets 14U Scott/Andrews with a 77th National Rank. Coach Schnute and the EC Bullets have been instrumental in elevating the level of Fastpitch played in Georgia. The state routinely fields some of the best teams in the nation. This is evident when you begin looking at the rosters of the Top 25 College Fastpitch Teams. Georgia athletes are well represented. The EC Bullets can take pride in the fact that they developed many of those current, past, and future players on those college rosters. The EC Bullets motto is "Play Like A Champion". Congratulations to the ECB Schnute Team for making that motto a reality in 2018! ©2019 EC Bullets Fastpitch - Official Site / SportsEngine. All Rights Reserved.